If you are training Muay Thai, then you need a good pair of gloves. When looking to purchase the best pair of Muay Thai gloves for your training, there are lots of factors you need to consider. So, I’ve put together this guide to help you make an informed decision, and buy the very best Muay Thai gloves for your individual situation. If you’re looking for a decent pair of synthetic leather training gloves for under £30, you can’t go wrong with the RDX Ego gloves. They are durable enough to last at least a year if you train regularly, have slim Velcro straps and are nicely breathable. The RDX Cosmo are another decent pair of synthetic leather training gloves. You will pay a few more pounds for the Cosmos compared to the Egos, but it’s worth it in my opinion because you get a thicker wrist cuff which make the gloves feel much more stable when wearing. If you’re looking to splash the cash and secure yourself the very best Muay Thai gloves money can buy, here are my top 2 high end options. These Twins gloves are probably the most widely used training gloves in Muay Thai gyms across the world. They are well crafted from quality leather which makes them extremely tough and durable – so, if you’re going to be hitting the heavy bag hard in training, these gloves will still last a good couple of years. They are nice and bulky for sparring so you can cover up well with them, and also protect your opponent when striking. Twins gloves come in a range of solid colours but don’t offer any of the flashy designs that some of the other Thai brands but do. Note: If buying online, check where the glove are being shipped from. Twins gloves are made in Thailand so ideally you want to find a seller who ships from your own country (or a nearby country) so that you don’t have to wait too long for delivery. Remember to get 16oz gloves if you intend to spar with them. These Fairtex gloves are another solid Thai brand choice. High quality leather and hand stitching again make them very durable for constant heavy bag use. Some people find Fairtex gloves to be a little rigid at first, but after a few sessions on the heavy bag you will break them in, they will mould to your hand size and become a lot more comfy. They have solid thick Velcro cuffs which make the fit very sturdy, and they offer great protection for both you and your sparring partners if you opt for the 16oz size. 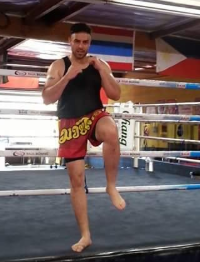 There are a number of popular brands across the sport of Thai boxing – you probably already know some of them if you train at a martial arts gym. I would recommend going with a well-known brand because most of them come with a reputation of quality – and that is why you will see so many people using their gear. Using an unknown brand will always be a risk, and you may end up having to buy a replacement within weeks. You don’t have to spend the earth to go with a reputable brand though. Here are some of the best Muay Thai gear brands that I would recommend going with. Originating in Thailand, Fairtex is the Rolls Royce of Muay Thai brands all over the world. Not only have they been around since the 50’s, they also build gyms across the globe and produce some of the best fighters the sport has seen. If you’ve got the budget to spend, opt for Fairtex gloves. All of the Fairtex gloves above are good solid training gloves, hand made in Thailand, with excellent stitch work. Fairtex gloves are known for their thick sturdy wrist supports and rigid design – you may find them a little stiff at first, but they will loosen up after a few training sessions (just like a new pair of shoes). Most people find Fairtext gloves nicely breathable, comfortable, and long lasting. Another Thai brand that you will see in every Muay Thai gym you visit is Twins. All of their gear is still handmade in Thailand and used by professional fighters globally. The above gloves are the Twins BGVL training gloves from various different sellers. They are probably one of the most popular training gloves in Muay Thai, and are very comfy and durable. Note: People with smaller hands may find Twins gloves to be a slightly looser fit, as they are bigger than most other Muay Thai brands – Average size hands will find them fine once you have your hand wraps on, and those with bigger hands will find them nice and snug. They aim to provide quality gear at a more affordable price than some of the big Asian and American brands. Some would argue that the products aren’t as well made or fit-for-purpose due to the fact that they don’t specialise in Muay Thai – but they’ve certainly got some good gloves for the budget conscious trainer. The above gloves are all synthetic leather gloves, and although not as durable and sturdy as the big Thai brands, they will still do the job for the casual trainer. 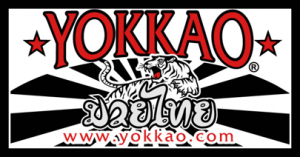 Yokkao is the relatively new-kid-on-block in Muay Thai brands, but is extremely popular amongst fighters and fans alike. Yokkao gear is known for it’s loud colours and flashy designs – great if you want to inject a bit of style into your training – but this doesn’t mean they forget about quality. All gear is handmade in Thailand and goes through rigorous product testing. Can I use western boxing gloves? Lace ups or Velcro straps? The type of Muay Thai glove you need will depend on the type of training you are planning to do in the gym. Bag gloves (or bag mitts as they are sometimes called) are designed for the sole purpose of striking a light punching bag, or even pads during pad work. They are lightweight and only offer basic protection to the hands of the person wearing them – they offer no protection externally to anything they come into contact with (especially another person’s face or body). You should only buy bag gloves if you have no intention of using them to spar with other people at your gym, because doing so could result in a very nasty injury to an opponent, and make you quite unpopular. If you only intend to use light punchbags and do light pad work during your Muay Thai training, then bag gloves could be a good cost effective choice. As the name suggests, sparring gloves are built solely for sparring with other people. They are heavy, well padded, durable and offer protection to both your hands, and your sparring partner. Sparring gloves are generously cushioned, offer good knuckle and wrist protection, and should have a very smooth outer layer to eliminate the risk of scratches to your opponents. If you intend on doing lots of sparring, and not much bag/pad work sparring gloves could be a good choice. Training gloves are the glove of choice amongst Muay Thai enthusiasts, from the seasoned fighters, to the casual fitness trainer. Above are a few of my recommendations. They are solid enough to be used on the heavy bags and sparring, whilst also being flexible enough for light bags and pad work. Training gloves also come in a range of weights which allow you to choose the best for your training needs. Note: I’ll talk some more on glove weights later in the guide, but generally speaking you need a glove weight of at least 16oz for sparring. So, if you’re just starting out in Muay Thai and want a pair of gloves you can use for all aspects of your training (bag work, belly pads, pad work and sparring) then get yourself one quality pair of 16oz training gloves. This will save you from having to splash out on two pairs of gloves, and allow you to invest your entire budget into one decent pair of training gloves. Can I just use western boxing gloves? Western boxing gloves are obviously very similar to Muay Thai gloves but there are some subtle yet important differences, which you can see in the table below. If you will be purely training Muay Thai, it makes sense to get a proper pair of Muay Thai gloves. All types of boxing gloves are measured by weight. Boxing glove weight is measured in ounces (Oz) and the heavier the glove, the more padding it contains, and the more protection it offers. The weight of the glove you choose will depend on the type of training you are intending to do. This chart should give you a good steer on the weight of glove you need. Do you need to buy multiple pairs of gloves? In an ideal world – it would be great to buy a different pair of gloves for each aspect of your training, but when restricted by budget and convenience, I would recommend getting one pair of 16oz training gloves. Training gloves can be used for bag and pad work, and if you get a 16oz pair, you can safely use them to spar too. When looking for Muay Thai gloves you will mainly come across two types of material that the gloves are made from – leather or PU/artificial leather. Genuine leather made from animal hide is the most tough and durable of boxing glove materials. It’s also breathable which means you will sweat a bit less, which will stop or at least slow down the process of your gloves becoming smelly inside. The downside is that gloves made of genuine leather will be more expensive than other materials. If you are serious about your Muay Thai and plan to be training more than three times per week, then leather gloves will be the best choice. PU leathers are artificial leathers, and are often used as a good cheaper and animal-friendly alternative to leather boxing gloves. PU leather is less durable than leather, which means the gloves will not last as long as real leather gloves –They also aren’t breathable. They do come cheaper and probably provide enough durability for the casual trainer, although you will find yourself needing to replace them sooner than a leather pair. When browsing for Muay Thai gloves online you will likely come across “Maya hide leather” sometimes even called “genuine Maya hide” in the product descriptions. This sounds like it might be a fancy type of leather, but it’s actually just a type of artificial leather, so don’t be fooled if you are looking for real leather gloves. It’s a decent PU leather, but it’s still not as strong as leather. As with anything, if the price looks to good to be true, it probably is. Muay Thai gloves need to be fastened at the wrist to ensure they stay on your hands – this will either be done with laces or Velcro. Whilst lace ups do provider a tighter fit, they are only really needed at competitive level. For most people’s training needs, Velcro provides a much quicker way of getting your gloves on and off in the gym – and provides a tight enough grip. How much should I pay for Muay Thai gloves? The price you pay for your Muay Thai gloves can differ greatly depending on the quality, brand and style you choose. For the casual trainer, around the £50-£70 mark is probably the sweet spot for a mixture of quality and cost effectiveness. I would certainly avoid going with anything under £20. Bear in mind that boxing gloves are hand made and lot of work goes into the production of every pair – so very cheap will usually mean very badly made. You can get away with buying cheap shorts or training t-shirts, but any protective gear needs to be of a decent standard, or you risk injuring yourself or others. Once you’ve brought a pair of gloves, be sure to look after them properly. A well looked after pair of gloves will last much longer than a pair that are neglected. And unfortunately some of that sweat will end up remaining in your gloves after you train. If you don’t care for the interior of your gloves properly when you’re not using them, sweat will collect and fester in your gloves, causing them to mould and smell like death. So how do you stop this from happening? Or at least reduce it greatly? Clean the inside of your glove with an absorbent kitchen towel after training. Pro tip: Use a sports glove deodorizer like the one below. Simply stick one in each glove when out of use and they will absorb moisture as well as killing germs and odours. Do not be tempted to leave your gloves to dry in a hot place like an airing cupboard or on top of a radiator because extreme heat can cause the exterior to crack – especially if you have real leather gloves. When caring for the exterior surface of your Muay Thai gloves, you’re simply looking to keep them clean and dry. Wipe them down with a dry cloth or kitchen towel after every training session to remove the sweat and dirt from other people’s faces – build ups of dirt and moisture can be very bad for leather. Once every week or two, wipe them with a slightly damp cloth. Never submerge your gloves in water or put them in the washing machine – the damage this could cause to the leather and foam insides could be irreparable. Hand wraps should always be worn during Muay Thai training in order to provide extra support to your wrist and knuckles, and prevent hand injuries. They also have an added bonus of absorbing sweat before it reaches your glove interior. Wear a fresh pair of hand wraps to every training session – never re use dirty wraps as they smell horrific and are extremely unhygienic. It’s best to have two or three pairs of hand wraps and rotate them throughout your training week. So which are the best Muay Thai gloves for you? As you’ve seen, there are a huge number of factors that will determine the type of Muay Thai glove you will purchase. Purpose – What will you be using your gloves for? Bag work? Sparring? Or a mixture of uses? Cost – Always try to get the best bang for your buck and only buy an expensive pair if you know they are high quality and tailored to your needs. And don’t forget, if you are sparring you will also need a good pair of shin guards and a mouth guard / gum shield.